Since April 2014, Canadians have come out in droves to support the P&G and Walmart Clean Water Program, raising more than 20 million days of clean drinking water for families around the world and propelling the initiative to within 20 per cent of its year-long donation goal. 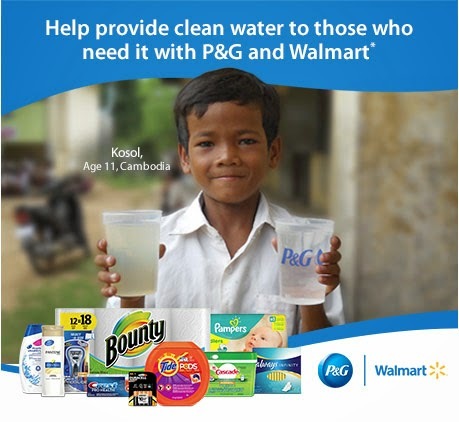 P&G has pledged to donate the equivalent of one day of clean drinking water for every participating P&G household product purchased in Walmart stores or online at Walmart.ca until March 19, 2015. By stocking up on P&G products, you’ll be taking a small step to make a big difference. How do you encourage your children to lend a hand in their local and global communities? On a quarterly basis our family also donates items to daycares and donation centres. When Hannah is a little older I would love for her and I to donate time with a charity that takes care of animals...it will just be hard for both of us not to want to take them all home! Hannah didn't have a birthday party this year, but when she does, she'll have "Twonie Parties". Guest will bring two twonies - one will be given to Hannah (allowing her to pick one birthday present versus receiving many she doesn't need) and the other will be given to a charity of Hannah's choice. By entering the following contest you are accepting that if you win your contact information will be shared with a P&G PR and shipping agency for the purpose of mailing your prize. Please allow 4-6 weeks from the contest closure date to receive your prize. This giveaway may appear on other blogs as part of the #PGmom program. However, to be fair, you can only win once per giveaway. If your name is chosen more than once, another winner will be selected. All winners must be from within Canada excluding Quebec. Valid entries only. Contest ends March 22nd, 2015. For further contest rules, refer to the Terms and Conditions within the Rafflecopter. Teach them to share at a young age. i show my kids by being a positive example by being kind to all and helping others whenever possible ..
We have a Seniors home right beside my Sons school. Sometimes we stop in to surprise a few people! Lights their day up! let them see you doing things that are kind and compassionate towards others - monkey see-monkey do! We take our grandkids to local charities with donations; instilling a giving nature is very important for us. Children learn what they live....gotta let them see us showing the spirit of kindness! I take my girls when I volunteer at the local homeless shelter. They learn by example that way. Talk to your kids about the struggles facing people that they may not be aware of and show them how rewarding it is to share what you have. Give them a small sum of money and give them the chance to direct how to donate the money. Provide ideas or take things discussed in class and use them as inspiration. I let my son see my husband and I helping out, either donating toys, money, books or time as well as letting him see us taking turns and being respectful to eachother. We never want to point it out to boast but with a small child asking many questions its a great way to start a conversation and inspire creativity. Children learn be example. We teach them to share and be nice to others. We also donate time, used toys and used clothes. Make rituals out of visiting and donating time and goods to shelters. Even just in the little things, help them to be thoughtful of others. Offering a drink. Giving up their spot on the couch. Always show them that by being nice people will be nice back to you. Point this out as it happens. It goes a long way. Live by example. They will only do what you do, not what you say. Teach them manners and use them yourself. Good manner, caring,sharing and helping others. Teaching them to be polite, sharing and caring of others. Lead by example. Let them see you being kind yourself, and they'll imitate your actions. Have them around or have them help with giving. I would have my boys come with me to pick up food items to donate, to drop off clothes and toys to be donated, etc. Lead by example. I teach Sophie that sharing means caring. Every year my family donates items for needy families, this has been going for three generations so it seems to be working! Teach them at a young age to give to others,and be kind to everyone. I think show them is the best way , you can't just tell them they have to see it ! Lead by example such as never littering, saying thank-you and letting your child see you show kindness. Keep a daily gratitude journal with your kids and each night list 3 items or events that happened that day that they are grateful for. That will motivate them to be kind. We set a positive example for our kids. They see us donate food, clothing, money to the local communities that need it. We tell them what we are doing and why we are doing it to help them understand that not everyone is as fortunate as we are. I think it is best to lead by example. Actions speak much louder than words. Foster kindness by giving to others. For example, go through your little one's used toys and both decide what they are ready to part with and donate to someone in need. Teach them to share and feel empathy for others. Start young and lead by example. Show your children the spirit of kindness! Show them real life situations of how others may not be as fortunate as they are, to instill an appreciation for what they have in life and to have empathy & compassion. Tell them how lucky we are and how others are not so lucky. Help out and include them in volunteering or donating. We sponsor a child at christmas, they love doing the shopping! Teaching good manners and to respect each other. Start letting them choose birthday presents for their friends as toddlers. Definitely set an example. get them to help you volunteer, collect items for hampers or christmas shoeboxes, etc! Show them love, teach them to share and be kind to one another. Don't shelter your children allow them to become themselves. It would be great to win this P&G Clean Water Prize Pack. Share tips for fostering the spirit of kindness in little ones. My tip is Show them love, teach them to share and be kind to one another. Teaching them to donate their stuff they no longer have use for. I teach my kids by donating to the food bank.